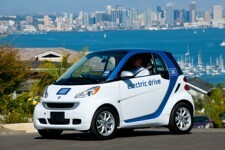 The all-electric car2go program in San Diego is going to start operations before the end of 2011 with 300 smart fortwo electric drive vehicles. All smart fortwo electric drive cars will be equipped with the latest car2go telematics technology, allowing fully automated, easy and convenient rental operations. As the world’s first free-floating carsharing service, car2go provides its members with the possibility to rent the cars spontaneously without having the burden to commit to a specific return time or location. The car2go program is already very successful in four cities with a total of more than 40,000 members and 1,000 smart fortwo vehicles with low-emission gas engines. The smart fortwo electric drive is powered by a 30 kW electric propulsion system. It is economical, quiet and emissions-free. In San Diego, the high-efficiency lithium-ion batteries can be recharged at designated EV charging stations. On a single charge, the car can travel up to 84 miles. Battery recharging time from 20 percent to 80 percent of battery full capacity is just three and a half hours. Recharging a completely discharged battery takes no more than eight hours, which makes it possible to recharge overnight. Past experience shows that this is seldom necessary, as the daily stretch covered by car2go drivers in urban areas rarely exceeds 6 miles. “By being the first to make an all-electric network of vehicles easily accessible for thousands of people, we are revolutionizing carsharing and creating the future of the urban transportation,” says Cole. The electric car2go vehicles will be charged at Blink EV charging stations developed by California-based technology provider ECOtality. The company is currently in the process of siting and installing the charging stations, and approximately 1,000 Blink commercial charging stations are expected to be installed by end of 2011 for public use in San Diego. The electric car2go service in San Diego will be operated by car2go N. A. LLC. Further details of the service such as business area, parking and charging concept as well as start of customer registrations will be announced in the near future.